With the unveiling of innovative new features for ADT Pulse® Interactive Solutions, America’s pre-eminent electronic security provider made its presence felt at this year’s Consumer Electronics Show. ADT Pulse and IFTTT Integration – The mobile app service that utilizes “If This, Then That” technology is partnering with ADT to provide home automation functions triggered by certain conditions – the digital equivalent of stimulus and response. Examples of IFTTT include adjusting smart thermostats to react to changes in local weather conditions and sending text alerts when certain monitored doors or windows are opened. Plans call for an ADT-IFTTT channel to become available in 2015, integrating ADT Pulse users with more than 100 IFTTT channel partners. ADT Pulse Total Security – The evolution of ADT Pulse continues with this top-of-the-line home monitoring product. Key features include a wireless control hub along with cellular and power backups. ADT Pulse Total Security would also expand remote access controls beyond the usual devices (door locks, lights, thermostats, etc.) to include garage doors, large appliances and ceiling fans. ADT Pulse Voice – This mobile app lets users control their monitored security systems, lights, door locks and more with voice commands. Access is protected by three levels of security, including voice recognition and device identification. 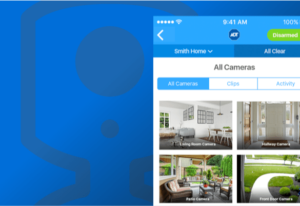 ADT continues to expand the monitored security and smart-home platform provided by ADT Pulse, which became the nation’s first mass-market home automation product in 2010. ADT Pulse features include remote access by smartphone or tablet, streaming security camera footage and several home automation capabilities. Want to Check Out ADT at CES 2015? ADT products and demonstrations are on display at Booth #71029, Sands Expo, Tech West. You can join in the conversation by following @ADTStaySafe on Twitter.